What do the founders of the Seventh-day Adventist movement, James and Ellen White, abolitionist Sojourner Truth, musician Junior Walker and cereal magnate C. W. Post all have in common? 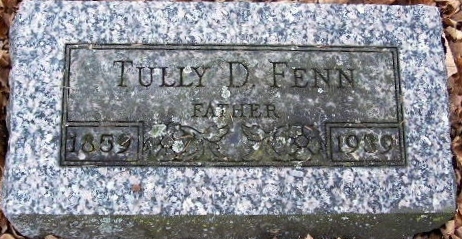 Their final resting place is in Oak Hill Cemetery, Battle Creek, Michigan, my current hometown. Oak Hill Cemetery is the burial place of many Battle Creek Pioneers. W.K. Kellogg, his brother John Harvey Kellogg, Eurastus Hussey, C.W. 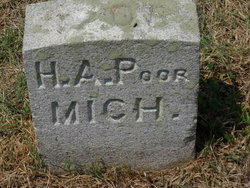 Post, Bill Knapp, Sojourner Truth, George Willard, and many other burials can be found here. Oak Hill Cemetery was founded in 1844. 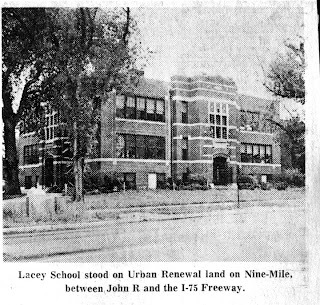 It is an important piece of Battle Creek history. I even have ancestors buried here. My great uncle and Hattie Fenn Glover's brother, Tully Fenn, and some of his family members are here. My daughter, Kirsten, was in 6th grade when I chaperoned a field trip to this cemetery. The students were given a list of tombstones to find. I don't know how interesting the students thought it was tromping around the cemetery, but I was fascinated. I went with the students that day, but was planning a return visit to take pictures, which I did a few years later. A visit to the cemetery on a non-Winter day is a good time to visit. If you would like to visit from the comfort of your home you can. Oak Hill Cemetery pictures can be found online. 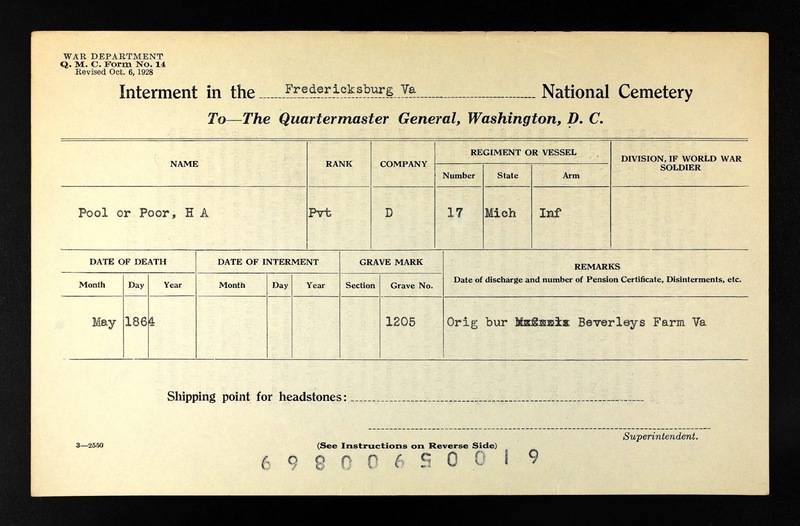 The most comprehensive website is from the Tombstone Transcription Project at US Gen Web. One starts with the Surname Index page for Oak Hill Cemetery to find the person they are looking for. Find a Grave has a page for Oak Hill Cemetery, too. 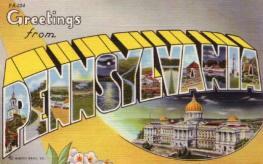 Find a Grave states that there are 28, 502 interments, fifteen that are considered famous. Oak Hill Cemetery published a book, Beyond These Gates, that covers the cemetery from 1844-1989. It tells the history of the cemetery and stories about some of the people interred at Oak Hill. If you would like to see where the pioneers of the Cereal City-Battle Creek, Michigan are buried then Oak Hill is the place to look. This blog post is to celebrate the history of Battle Creek, Michigan, my hometown for the past 25 years. 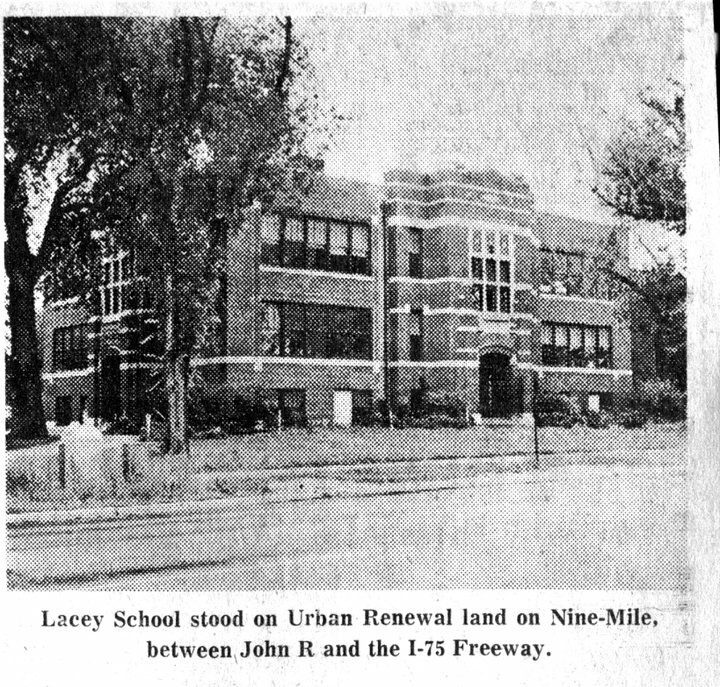 I try to post one article a month on the heritage and history of Battle Creek, The Cereal City! My great uncle Merle M. Glover's obituary said he was buried in Arlington National Cemetery, Arlington, Virginia, but when I used the Veteran's Gravesite Locator I could not find him. 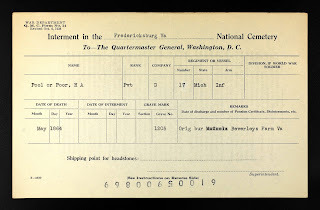 The reason for that is that Arlington National Cemetery has its' own gravesite locator website. After I requested a photo through Find a Grave I discovered that Arlington National Cemetery website has a picture there, too. Next, I found his memorial at Find-a-Grave and requested a photo. David McInturff graciously accepted the request and posted three marvelous pictures there. 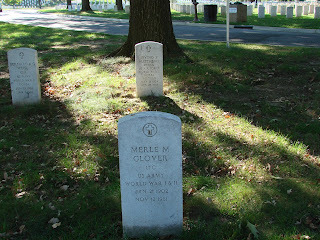 Lt. Col Merle M. Glover and his wife, Violet Genevieve (Dout) Glover, are buried there in Section 53 Gravesite 1828. 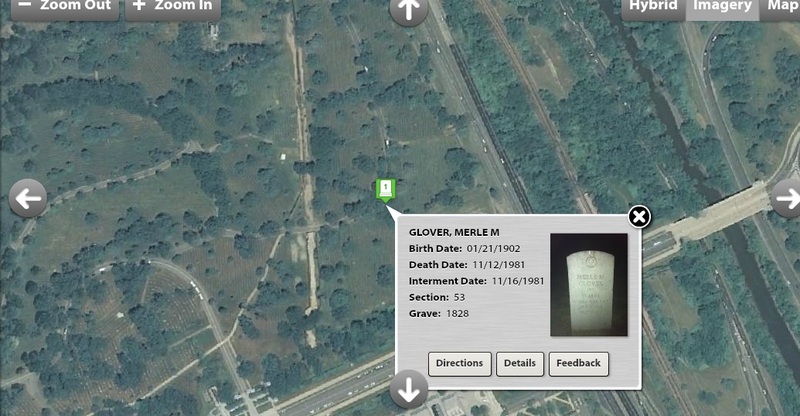 The website for Arlington National Cemetery provides a location map with the search results. 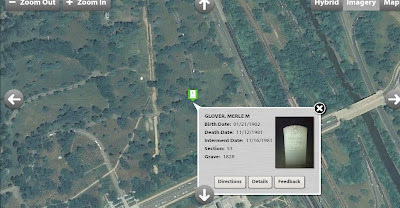 The green number 1 shows the location of the burial. The picture below is in hybrid mode, you can click imagery for another view and map for the map view. 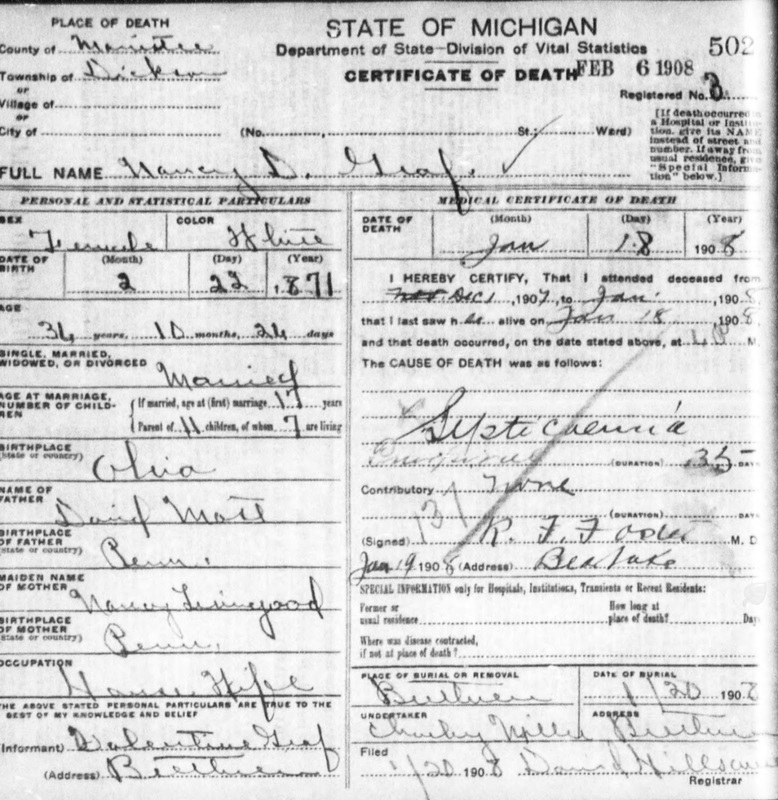 If you click on the number on the website, it provides birth date, death date, burial date, section and grave site information, and a picture. 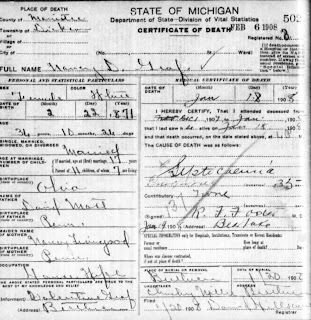 Merle McKinley Glover was born 21 January 1902 to Frank H. Glover and Hattie Lodema Fenn Glover. He married Genevieve Dout 31 May 1927. They had two daughters, Marylyn and Barbara. I wrote a previous post about Merle running off to Canada to join the military here. He made a career in the military, retiring as a Lt. Colonel. Our son, Travis, is celebrating a birthday today and I plan on reminiscing about his second birthday. We were living in Battle Creek, Michigan on WahWahTaySee Way at the time of Travis' 2nd birthday. 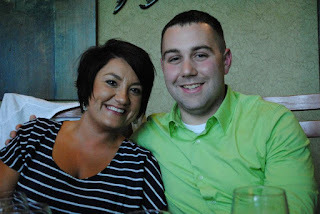 Kirsten and I took Travis to Bill Knapp's for lunch. Bill Knapp's was a great place to celebrate birthdays. The children's menu had their meals labeled with animal names. Kirsten and Travis liked ordering that way. They gave the birthday person a free chocolate Celebration cake and "Happy Birthday" was played over the loud speaker. My kids loved Bill Knapp's and their chocolate cake. We were sad when it closed. Bill Knapp's Celebration Cake recipe was purchased by Awrey's and can be found at some grocery stores now. Travis trying to put his soccer goal together as his sister, Kirsten, looks on. Kirk was working at Minges Brook Elementary that day. When he got home Travis opened his presents. Kirsten got Travis a Little Tikes Ferry boat. Other gifts he got were a Fisher Price soccer set, clothes, wooden peg sorter (which I still have) and money. Travis opening clothes, he looks happy. The Little Tikes ferry boat is in the background. We weren't living near any family at this time, so we had a quiet dinner with just the four of us. I had made a small cake, so he got two cakes for his second birthday! Travis is living in Florida now and I hope he has a great birthday. Our son, Travis, is dating a wonderful young lady named Alayna. Today is her birthday. Happy Birthday! I hope your year is as special as you are. Are you looking for a way to connect with family members? Try Facebook Groups. I started a Fredricks Genealogy group on Facebook in 2010. 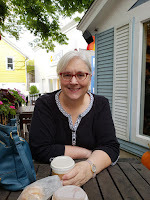 I thought it would be a great place to share family information and pictures with family members who might not read a blog regularly. This group covers information on the family of my grandparents, Otto August Fredricks and Daisy Ellen Graf. I am so pleased with the results of this group. My hope was that this would be a place to connect with family members. 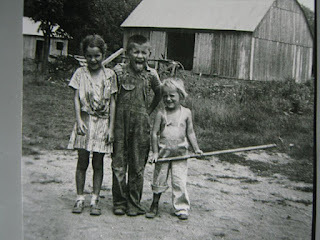 I hoped we could open up our photo albums and share; and share, they did. 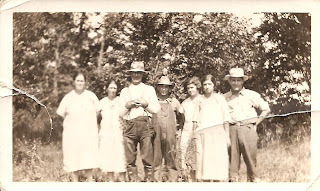 One of the pictures shared was an early photo of my aunt, Lola Fredricks Brown. I had never seen it. Her granddaughter shared it along with their wedding photo. 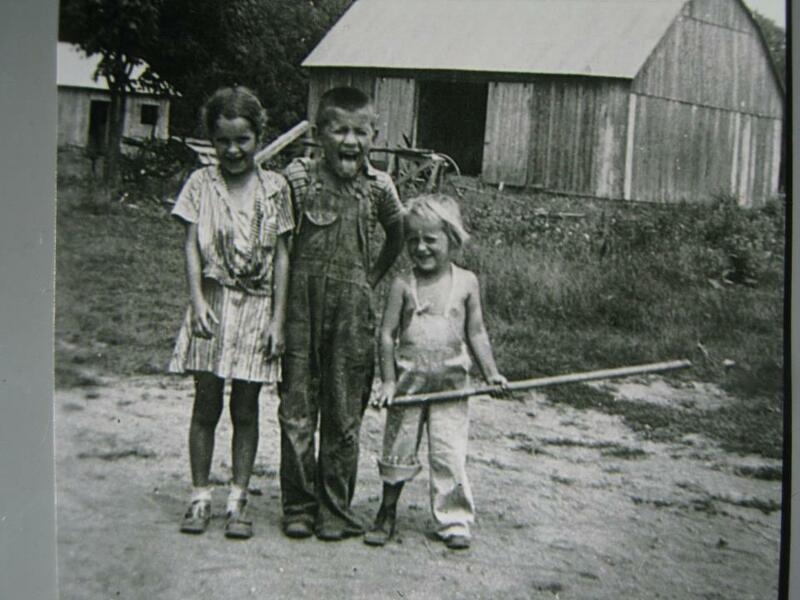 Another one I loved seeing was of the twins, Norma Jean 'Jeannie' and Norman Eugene Fredricks and their cousin, Rose Marie. It is precious, and another one I don't know if I would have seen if it wasn't posted by Rose Marie's daughter. A discussion ensued on facebook about this that was fun to read. In December, I started posting mystery pictures. Some I knew who were in it and a couple I didn't know. The first one I posted was of Valentine Graf and Nancy Mast on their wedding day in 1888. 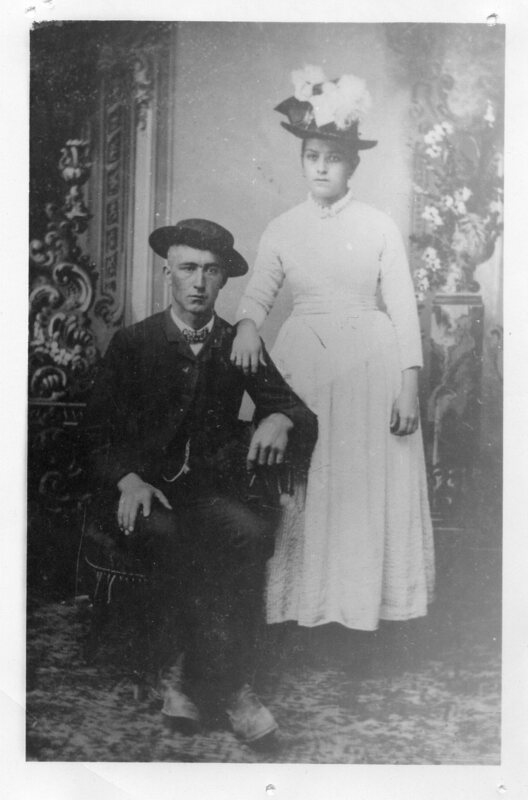 Valentine and Nancy Mast Graf were Daisy Graf Fredricks parents. It was a photo I was sure no one had seen before. It was fun to see the guesses. Eventually, someone guessed correctly and then I re-posted it with the information about it. The pictures I didn't know about were solved by other family members. I posted baby pictures, Christmas pictures, etc. My cousins seemed to enjoy the guessing games, from these posts stories started coming out. I was even contacted by a cousin in California. She shared pictures with me via email. She gave me permission to post the pictures on Facebook. 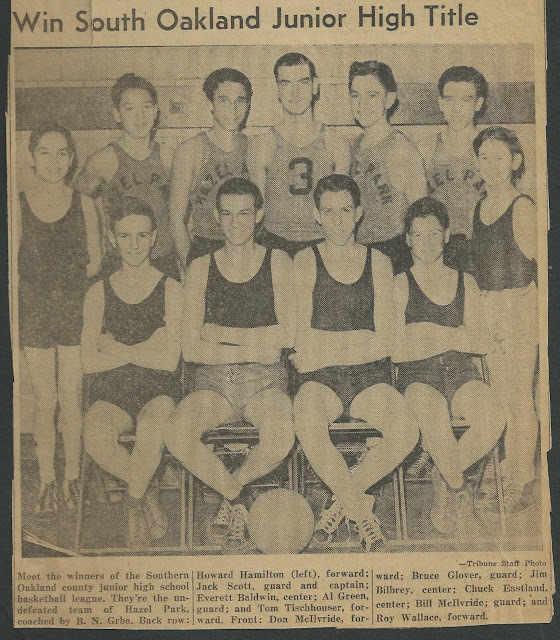 The Fredricks Facebook group has been a fun way to share the information I have found on the family, but even more fun has been seeing what others share. Do you have a unique way that your family shares information? Please share in the comments.